SteriPEN Ultra™ is SteriPEN flagship model with the most advanced user interface featuring a user-friendly OLED display (Organic Light Emitting Diode). Ultra’s 8,000 treatment lamp delivers a lifetime of purification. It features an internal lithium battery rechargeable with any USB interface. Internal battery that's recharged from any USB power source. Low-power indicator lets you know when battery needs recharging; when fully charged you can treat 50L. Ultraviolet (UV-C) light rays safely sterilize clear water by destroying 99.99% of protozoa (including Giardia and Cryptosporidia), bacteria and even viruses. Protects from risks that cause botulism, cholera, dysentery and typhoid, just to name a few. Purifies 0.5L of water (cold or warm) in less than a minute or treat 1L in 90 seconds. Designed to fit perfectly into store-bought bottles of water. Can be used up to 8.000 cycles. Watertight seals keep water away from the electronics. Use only on clear water. 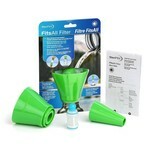 For cloudy, sediment - laden water use Steripen FitsAll prefilter (sold separately). 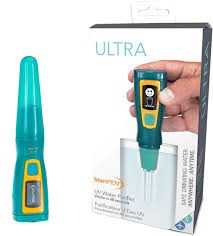 Includes: SteriPEN Ultra water purifier, USB cable, carrying case and instruction manuals.